Fast action, intense competition - it´s SPIKER! 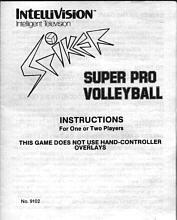 SUPER PRO VOLLEYBALL. Here comes the serve . . . just beyond reach! Dive! BAM - got it! The ball´s in play . . . set it - it seems to hang above the net - run and SMASH! spike it over! All the fun and excitement of a real volleyball match!